Alien vs. 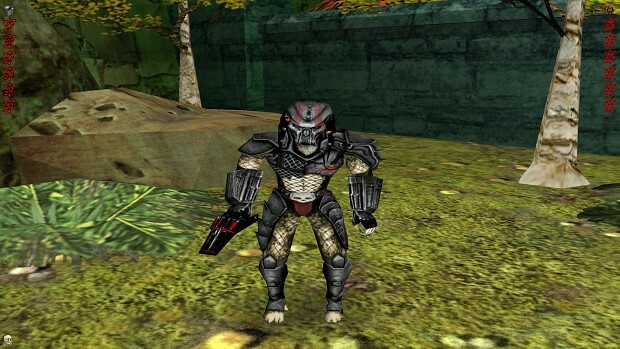 Predator 2 combines elements, creatures, and settings from the hit movies Aliens and Predator in three unique, interlocking stories. They unfold from the perspective of a young Marine Corporal, a newly-emerged Alien, and a Predator on the hunt. Highly detailed environments, phenomenal effects, and an advanced game engine intensify the gameplay of this first-person shooter adventure. Scarface, also known as the "New Way Devil", was a Yautja from the Dark Blade Clan. He first came to Earth in 1930 to conduct a hunt in New Way City. Despite being an experienced warrior, the hunt was a failure that led to his technology falling into the hands of humans, a disgrace for which he was banished by his clan. A century later he returned to New Way City, now called Neonopolis, to redeem himself and regain his honor. Drag the Rez file to your avp2 custom folder and type in the COmmand Line Parameters "-rez Custom/Scarface.rez" and Play the game with the Skin. P.S Scarface is The Best and Strongest Predator of the Franchise! Scarface Predator - PREDATOR: CONCRETE JUNGLE has not been tagged yet.